Kin + Kindling - Play it where it lies. Lately, I’ve been finding myself being a bit of a “Debbie Downer.” I don’t know what is causing it or why I’ve been feeling so “meh,” but last weekend, the grumpiness came out in full force and I was miserable and negative all weekend long. For two entire days, it seemed like every little thing was frustrating me. Last minute plan changes, crummy weather making even more plan changes, and just overall feeling stuck in a rut. There was nothing to the weekend that made me feel that way. I was able to spend quality time with my family, we had company for a nice visit Friday night, Marleigh had a fun slumber party at our house with her cousin on Saturday, and the first snow on Sunday really was beautiful (even if it was much too soon!). Then Monday came and the spiral continued with the news I received at my neurologist appointment and I hit my emotional boiling point. I get this way every so often. Little things get to me and I start feeling like I want to crawl out of my own skin. I want to get out of the house but I don’t know where to go or what to do, and I know I’ll miss Luke and the kids if/when I go to leave. I crave a date night but don’t know where we would go because I actually don’t feel like doing anything. I want to sleep in a hotel bed until 11 AM and not feel guilty about it, but I know that renting a hotel room for an overnight in our own city makes zero sense financially. I go back and forth in my own head with things I want to do and then why I shouldn’t or can’t do them. It’s silly and ridiculous and I know I’m being ridiculous about things when it happens but I can’t snap myself out of the funk once it comes over me. Maybe I’m getting a little too real here but I can’t be the only one who feels this way every once in a while. Right? 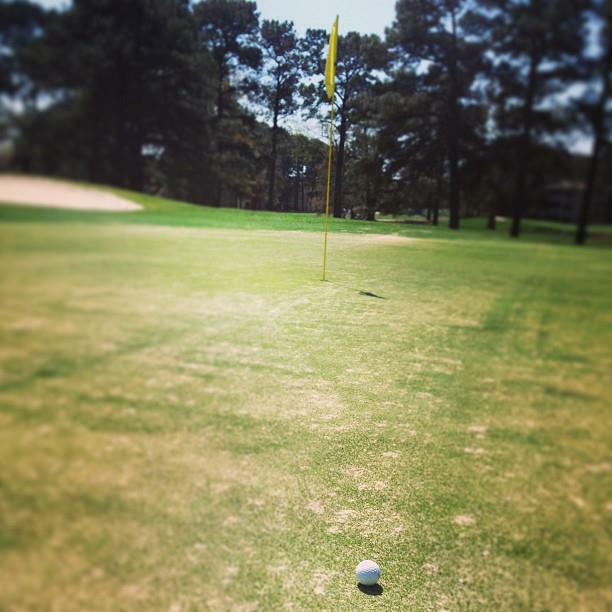 The best way I can put it is that my life kind of feels like I’m playing a bad game of golf. Right now, I feel like my ball is off the fairway and the pressure is on to fix it. I need to play it where it lies to get back on course. It’s time to take matters into my own hands and rediscover/appreciate the good rather than fixate and freak out over the not-so-good. To get out (or stay in) and feed my introvert personality with some alone time. To take some time to be an adult with my husband and do things that I usually don’t get the chance to do. Sip a latte while it’s still hot, read a book cover to cover, take a bubble bath, get some peace and quiet. What do you do for “me time” when life is leaving you feeling overwhelmed? I’d love to hear your suggestions!